Did you know that the Republicans inserted a change to the administration of the Voice of America (VOA) network in the December military authorization 'must pass' bill? The VOA has always been administered by a bipartisan broadcasting board of governors--distinguished nonpartisan media experts. The change was to have the $800 million budget Voice of America run by a CEO appointed by and directly responsible to the President of the United States. Trump has now appointed (maybe temporarily) two twenty-something Trump political operatives to oversee the VOA. Matthew Schuck is a 2012 graduate from the nondescript Montgomery College who got his start with the Heritage Foundation and then the (alt) right-wing site Daily Surge and worked for the Trump campaign in Wisconsin. The other, Matt Ciepielowski, does not have even that modicum of (mis)understanding of journalistic standards: he is a 2012 graduate of Quinnipiac University and a Republican political strategist who worked for the right-wing Americans for Prosperity organization before he became the NH state director for the Trump campaign. He also has ties to Ron Paul (Texas libertarian). See, e.g., Trump moves to put his own stamp on Voice of America, Politico.com (Jan. 23, 2017); Donald Trump sends two aides to Voice of America studios, raising fears he's going to politicize the outlet, Salon.com (Jan. 24, 2017). In other words, it appears that the Trump enterprise in the White House wants to convert the Voice Of America into a propaganda arm for Trump's "alternative facts" reality show in the White House, just as Sean Spicer, the Press Secretary, has served as a spouter of misinformation and what Trump's "beliefs" are rather than what the actual facts are. Compare Kellyanne Conway's statement that we shouldn't listen to what Trump says but should "look at what's in his heart". See e.g., Aaron Blake, Kellyanne Conway's laughable 'look at what's in his heart' defense of Donald Trump, Washington Post (Jan. 9, 2017). Just ways of claiming that lies and distortions don't matter and allowing Trump political operatives to say whatever they want. The Voice of America director Amanda Bennett did pull a tweet on Spicer's erroneous statement reiterating Trump's "biggest inauguration ever" claim. Her claim is that stories aren't "balanced" unless they have a response from the Trump administration. That's hooey. Having to have Trump's version of alternative facts embedded in every VOA story converts the story from news to propaganda. And this matters for tax policy. Ask yourself. How can we have any kind of legitimate discussion or legislation on tax when the Trump administration distorts information and presents "alternative facts" that suit the 70-year-old narcissist in the White House, whether or not they have anything to do with the evidence or issues at hand? Who drew the biggest crowd: Obama, Trump or Calangute beach in Goa? As most everybody is aware by now, the IRS has been under considerable strain for a number of years from budget and staff reductions that have left it underfunded, understaffed, and under pressure. This is part of the right's effort to "shrink the government to a bathtub and drown it." If the main organization for helping Americans understand their tax obligations is understaffed, it is likely that many people will become irritated with the agency and blame it (and taxes) for all their problems. If the main organization for enforcing the U.S. tax laws fairly has too few people to audit the most likely scoflaws and too little money to prepare guidance and rulings to make it harder for scofflaws to scoff at the law, then many people will become irritated with the agency and blame it (and taxes) for their problems while many other people (especially the privileged rich) will continue to scoff at the law by overstating their basis when they sell capital assets, hiding assets in tax havens, and just hiring lots of expensive tax attorneys and accountants to come up with schemes for wiggling through the loopholes in the Code to avoid more taxes. And of course, if the main organization for ensuring that tax-exempt organizations are not abusing their tax exempt status by using "dark money" to allow the domestic elite and foreign powers to influence and control federal elections and legislation, then odds are the rich and elite and foreign powers will wield more and more influence and control over who gets elected and what kind of legislation they pass. Odds are we will see even more of the kinds of absurd legislation disenfranchising the poor and minorities by making it harder to vote, harder to get a State-issued I.D. card, harder to wait in line for hours at the polls (if you will be fired for not reporting to work), etc. None of it is good government. All of it is supported by the current radicalized uber-right-wing Republican Party hacks that are running many state governments and hold the majority right now in the U.S. Senate and House of Representatives. As the New York Times editorial board noted, "[c]laiming a 'social welfare' tax exemption has become a tool for powerful political operatives like Karl Rove, the Republican campaign guru. His Crossroads GPS group, which has 501(c) status, has spent $330 million on ads and candidates since it was created in 2010." See Editorial, Dark Money and an I.R.S. Blindfold, New York Times (Apr. 28, 2016). And of course, with all the ranting about it being a problem to pick a group with "Tea Party" or "Progressive" in their name for closer scrutiny (when any common sense analysis will tell you that such a group is quite likely to be engaged in forbidden lobbying activities), "the IRS has groiwn ever more gun-shy about enforcement." So the latest bill wreaking havoc on democracy, put forward by Republican Peter Roskam in the House of Representatives, would eliminate the current law that requires those who donate more than $5000 to a nonprofit to be disclosed to the IRS (though redacted for public versions of organizations' tax forms).. See, e.g., Richard Rubin, House Republicans Seek to Block IRS Collection of Non-profit Donor Data, Morningstar, Apr. 28, 2016. That means a foreign corporation or a foreign sovereign power could contribute enormous sums to shape the legislative and regulatory regimes in our country, and there would be NO WAY TO POLICE THE PROBLEM. Further, it is hard to understand why any donor to a tax-exempt organization should be entitled to anonymity. The organization is able to avoid paying any taxes on the funds received, and--especially under the current malevolent eye from Congress towards the IRS--the IRS is hamstrung in enforcing the law against political campaigning with 501(c)(3) funds. What we should do instead of allow complete anonymity and the power plays that encourages is the opposite: the name of every donor who gives anything more than some de minimis threshold amount to any tax-exempt organization should be publicly available, and the amount given should be publicly available. After all, if money is "speech", "speech" is supposed to be heard. Remember the old saying about the tree that fell in the forest and whether there would even be any sound if there were no eardrum available to hear it. That's certainly the case with speech. If giving money is a form of speech, than the gift and giver shouldn't be hidden under a bushel but should be broadcast far and wide for anyone who wants to know. Note that the bill would also mean that the 'dark' groups under 501(c)(4) wouldn't even have to provide information about the number of large versus small donors that it has. By the way, if you have any doubts that Peter Roskam has no interest in the best interests of ordinary Americans, remember that back in November he was one of the gang of four that proposed pre-empting the rule expected from the Labor Department to impose a "best interest" standard on retirement advisers. They were so worried (weepy face) that some professionals who handle money for retirees might refuse to do it any more if they weren't allowed to continue paying more attention to lining their own pockets rather than providing sound advice to their clients. See Teresa Tritch, A New Threat to Your Retirement, New York Times (Nov. 19, 2015) (with a swarmy picture of Peter Roskam). Somehow it seems that the more absurd the congressional Republicans get, the greater their hubris and gall in proposing ideas that would hit government programs hard and create havoc for critically important government activities. The latest is the right-wing "Republican Study Committee", a caucus of 172 of the far-right members of the GOP, and their "Fixing the Tax Code" release. They argue, for example, for Goodlatte's bill to "terminate the tax code" in 2019 in order to "force" Congress to implement a new tax system by a firm deadline. (Goodlatte, by the way, is a typical obstructionist right-winger Republican from Virginia who has evidenced numerous rather absurd positions in the past. He should not be listened to by anyone.) 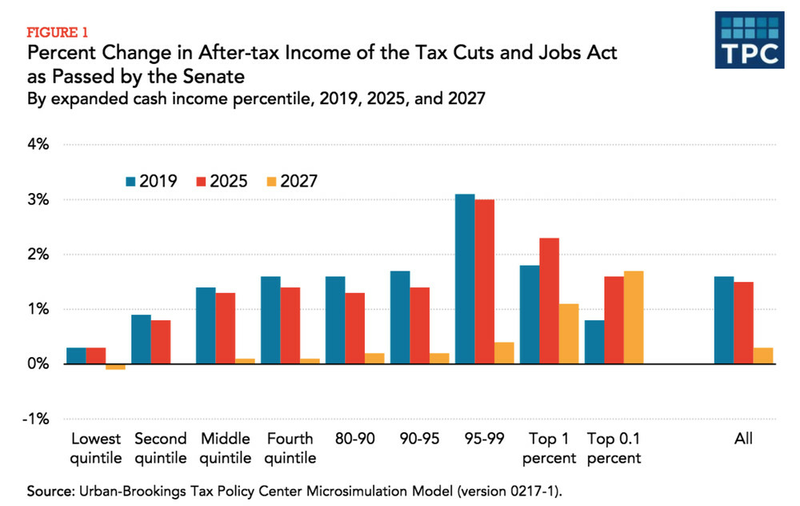 Their recommendations--more redistribution to the wealthy by lowering rates overall to 25% and cutting the tax on the types of income that the wealthiest Americans receive most of (capital gains and dividends) to a flat 15% rate. This is, to put it bluntly, insane. You don't set the way the tax code works by some a priori decision to lower rates so the wealthy pay less tax. You determine how the tax code works, and how much revenue it should raise, by what kinds of obligations already exist that have to be paid and by considering carefully government programs and appropriate and fair ways to raise tax revenues to fund them. You can't "terminate the tax code" on a fixed date and expect anything other than anarchic chaos to result. It is enormously hard to write a full tax code that adequately addresses all of the human activities (and entity transactions) that have to be taken into consideration. To come up with the 1986 recodification of the tax code took a year and a half of concentrated work by a team of congressional taxwriters trying to reach a bipartisan result--something that hasn't existed for at least the eight years of the Obama administration. And that group wasn't trying to completely redo the entire code. It didn't "terminate" the existing code, but rather worked within that system to make determinations about provisions that were unworkable, outdated, or just plain bad. For example, it eliminated the capital gains preference, because it is clear that the characterization of income as capital or ordinary is one of the major complications of the code that allow for gamesmanship by rich people and support redistribution to the wealthy by privileging the type of income they mostly receive. Congress, of course, responded to intense lobbying by the wealthy and reinstated the privileged tax rate within 2 years (retroactively). This is further evidence that the Republican majority in Congress is incapable of dealing with actual facts about how tax systems work, what revenues are needed, and what the needs in the U.S. are for revenues. It also reveals the abject hypocrisy of the rightwingers in Congress. They won't uphold their duty to "advise and consent" on a presidential nominee for the highest court in the land, because they want to be able to obstruct the appointment of anybody that isn't as right-wing as they are. They claim it is because the people should have their voice heard by electing the next president (though that's just a sham argument--they want to obstruct things they don't like, whatever the Constitution should actually allow). But they don't see any problem with a radical treatment of the tax code along the lines they want, even though they may not be in the majority of the Congress after this election. Hypocrits. Liars. Self-serving corrupt ideologues. That's what this right-wing caucus is all about. Should a society be judged on the way it treats its less fortunate?